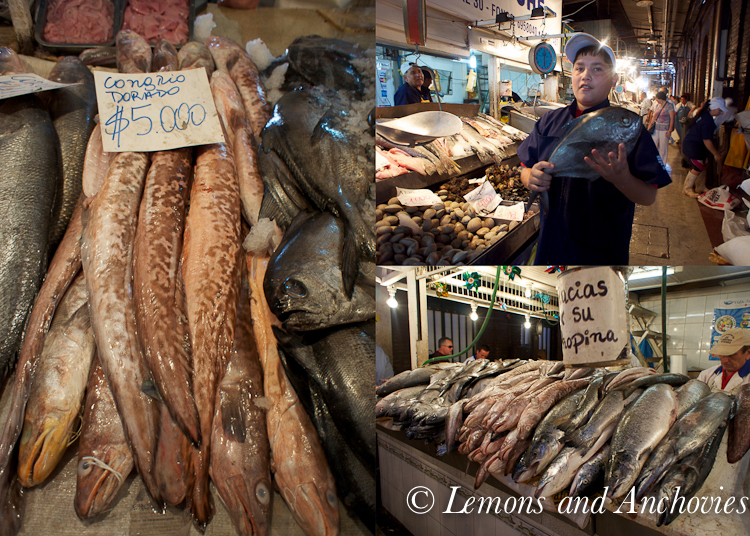 * This is the long-overdue conclusion of my Taste of South America series. For parts 1 – 3, please click here, here and here. What do volcanoes, Middle European architecture, the Eiffel Tower, wild boars and penguins have in common? Before my South America trip in February, I would never have guessed that Chile was the common denominator. The third and fourth legs of our South American tour took us to Puerto Varas–a popular base for Patagonian tours–and Santiago, respectively. 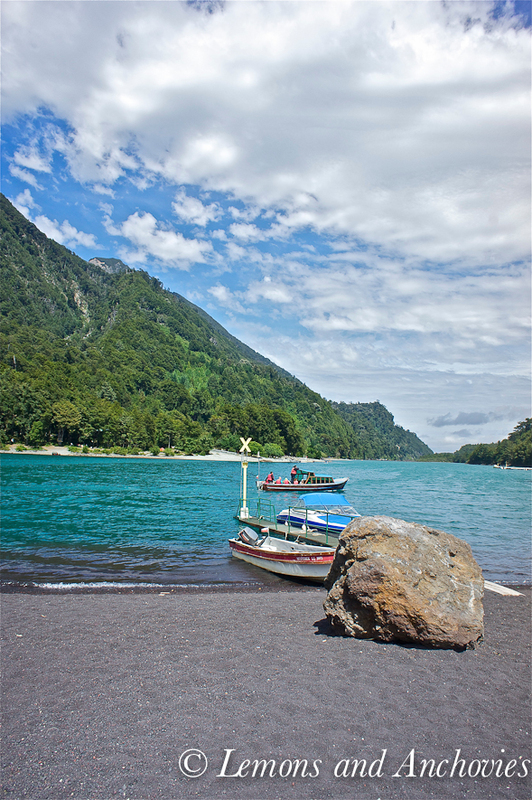 Originally, our first Chile stop was to be in San Carlos de Bariloche in the foothills of the Andes. 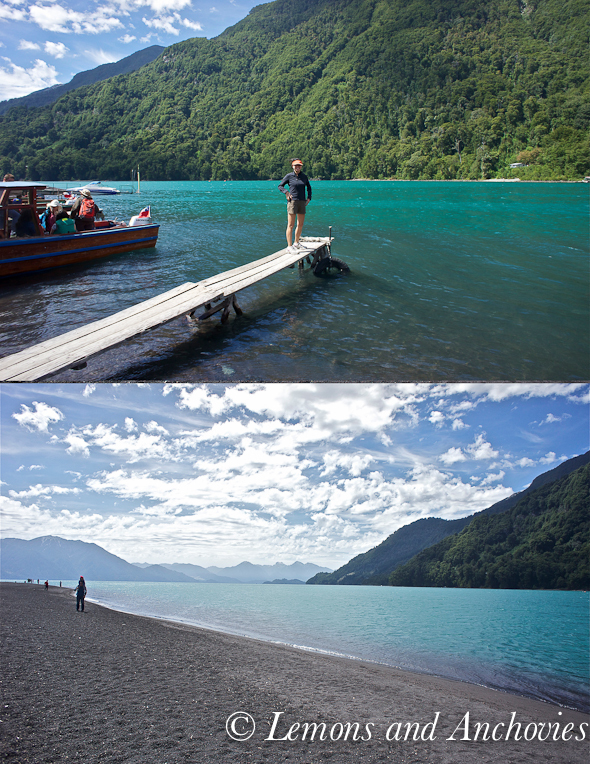 However, lingering ash clouds from the Puyehue-Cordón Caulle eruption last year forced us to change our plans. Puerto Varas was our alternate destination. …oh, and they have some of the best empanadas I’ve ever tasted. Recipe below. 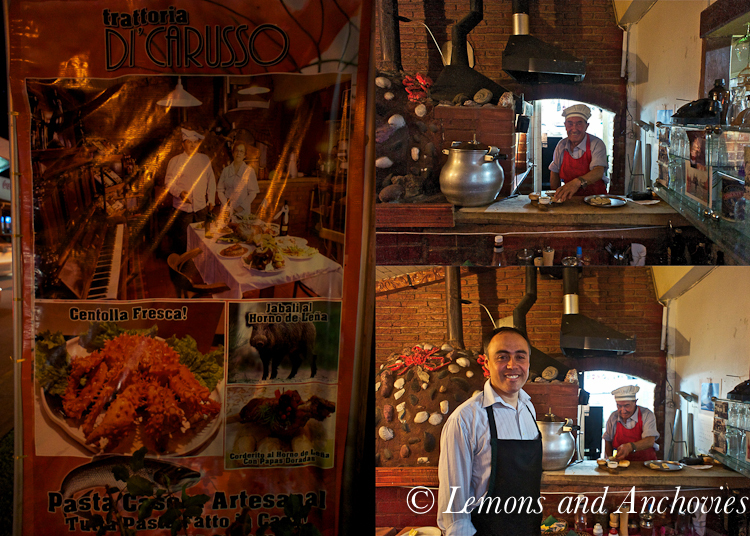 Trattoria di Carusso, Puerto Varas: A family-owned business. Trattoria di Carusso, Puerto Varas. We arrived on Valentine’s Day and our hotel couldn’t secure dinner reservations for us. Instead we walked about town admiring the Bavarian architecture of this lakeside town (result of German colonization in the 19th century), stopping for cocktails and ending up at Trattoria di Carusso. They would be able to seat 6, we were advised but the menu that night would be limited. The house specialty was wild boar roasted in a brick oven. 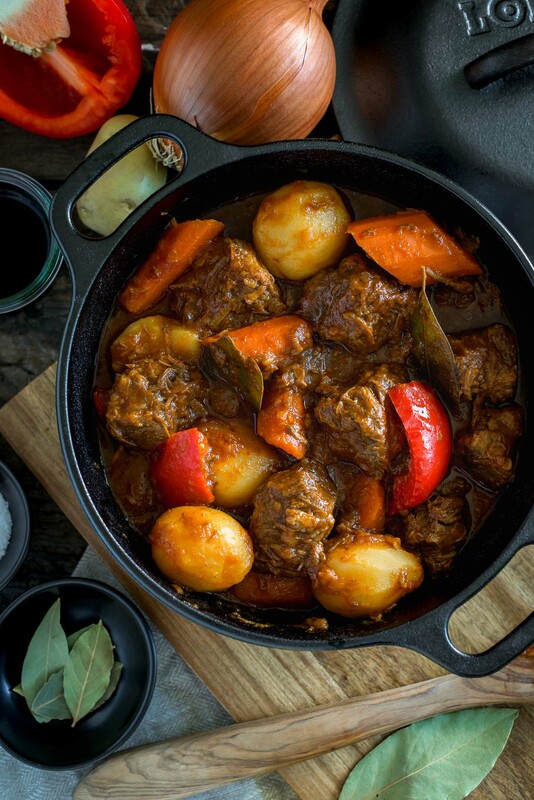 This has been their featured menu item for decades (they raise the wild boar) and while I opted for paella (outstanding) that night, I had a taste of my friend’s roasted boar–cooked to perfection, leaving me regretting my safe selection. Several generations of one family were present the night we visited–a charming lot they were! 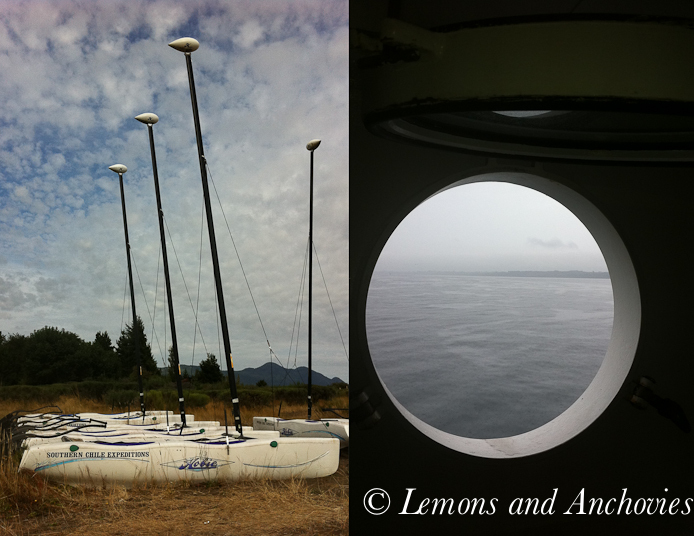 We had one rainy day during our stay in Puerto Varas, forcing the cancellation of a day of fishing for the men. We opted instead to take a ferry ride to the island of Chiloe. More on Chiloe later. 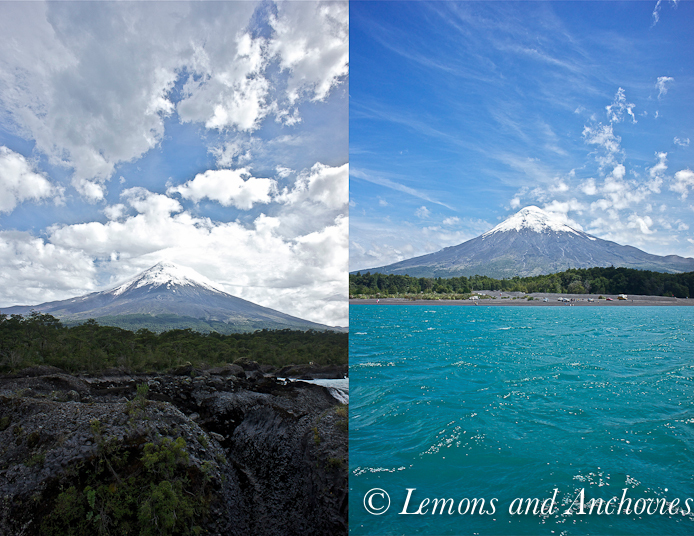 While this part of Chile was beautiful to see from every angle, Osorno Volcano often stole the spotlight. 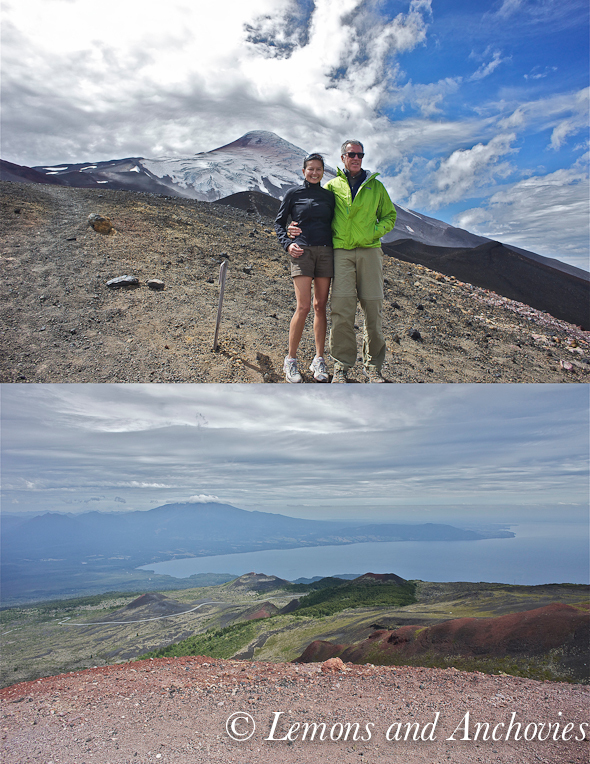 We enjoyed fantastic views of Osorno from our hotel, from the river, from the lake…and yes, we hiked it, too. 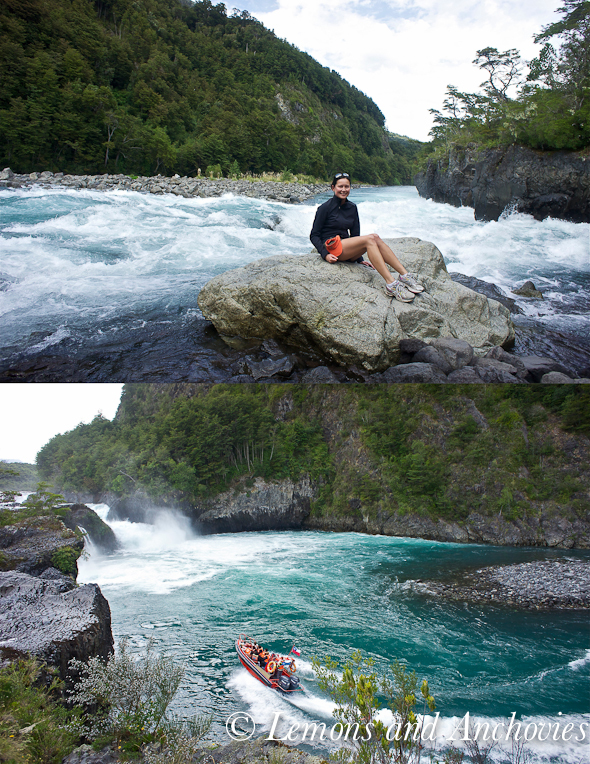 There was no shortage of magnificent water views at Saltos Rio de Petrohe and Parque Nacional Vicente Perez Rosales. The colors were right out of an artist’s palette. Saltos Rio Petrohe and Puerto Varas in the Patagonia region of Chile, a town rich in German tradition as a product of German colonization in the 19th century. 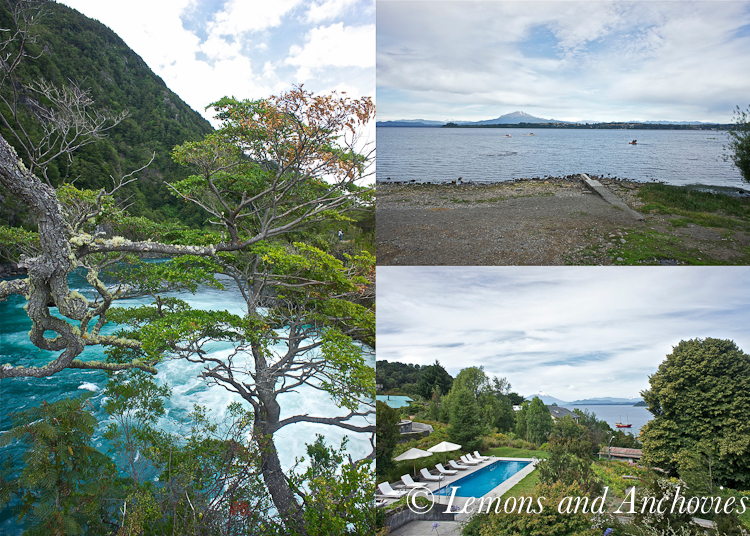 The falls, waterfront on Puerto Varas and view from our hotel. 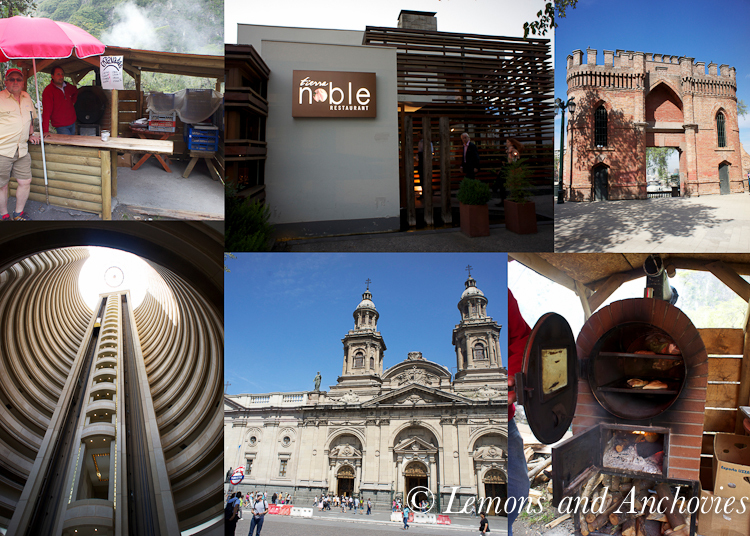 The final leg of our two week South American vacation was in Santiago. I didn’t really know what to expect but the vistas of the mountains from our hotel alone were worth the visit. We hired a guide to give us a tour of the city–it’s really the best way to become acquainted with Santiago for there is so much to see. From humble empanada stands to fine dining options, both were abundant in Santiago. Mercado Central de Santiago. Conger Eels and a gracious young man who chose one of his best fish for this shot. 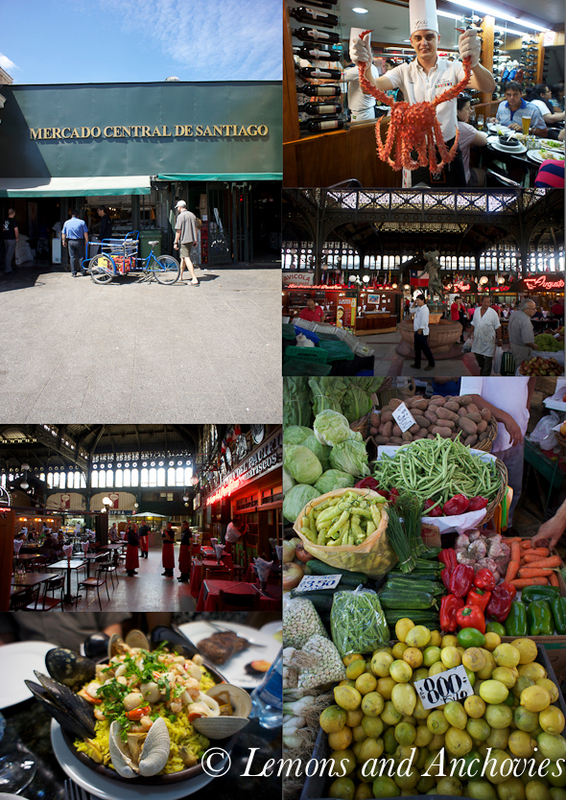 No visit to Santiago would be the same without stopping at Mercado Central. Its claim to fame besides the market rich with fresh seafood, produce and good restaurants–the building itself was designed by Gustave Eiffel (yes, that Eiffel). I enjoyed some of the best ceviche on this trip and a few variations from one lunch at Mercado Central. Humboldt Penguins on Chiloe, Chile. 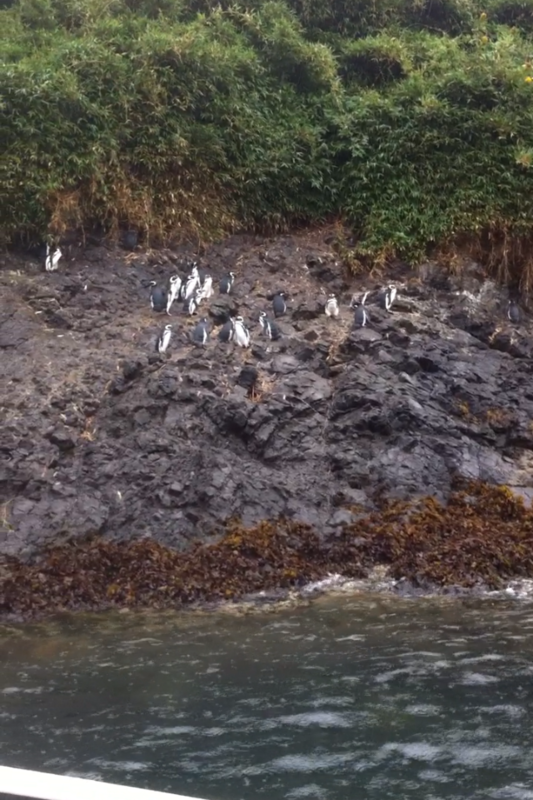 On that rainy day when we decided to take a ferry to the island of Chiloe, we saw these guys. After an hour drive from the ferry station to the cove of Puñihuil, we drove up to a huge beach and arranged for a boat to take us to the islets to see Humboldt and Magellan penguins (the penguins migrate here during the summer season). The other highlight of this day trip? We had lunch at a small restaurant on the beach before our boat tour. After enjoying empanadas for two weeks from both fancy restaurants and humble stands, I really didn’t expect to be wowed anymore at the end of the trip. But Chile saved the best for last. I ordered a baked beef empanada for lunch and what came out was the size of a dinner plate. Hands down THE BEST empanadas I had on the trip. I tried to recreate the empanadas from Chiloe shortly after I returned home. The simple filling wasn’t greasy and the pastry was thin and light. With inspiration from a Chilean cookbook that I picked up at the Santiago airport, this is what I ended up with. I tried to stay true to the classic preparation of Empanada de Pino as much as I could. This Chilean version is filled with beef, onions, spices, raisins, olives and eggs. 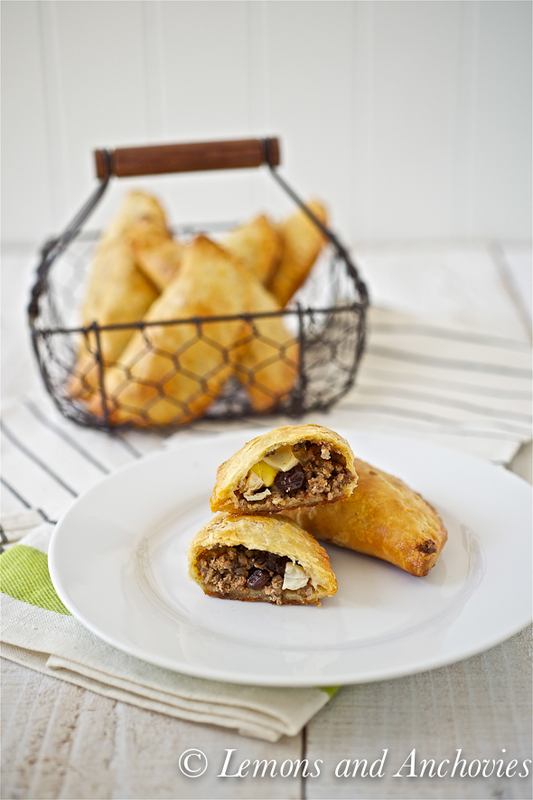 I grew up eating fried empanadas with beef, onions, eggs and raisins but this baked version has become my favorite. Though I skipped the lard (traditional ingredient for preparing both the dough and the filling) and used an America’s Test Kitchen recipe for the dough (a keeper), I’d say that this came very close to tasting like the one I had in Chiloe. The kind Chilean woman who served the original ones to us would be proud. ** Now that I’m done with this series, I will start with a new one: Local Spotlight. From time to time, I will feature some of my favorite spots–towns, restaurants, foods, markets. Stay tuned! Empanadas de Pino are classic Chilean empanadas. They are baked with traditional ingredients consisting of meat, onions, spices, raisins, eggs and olives. To prepare the dough: Using a food processor, pulse the flour, sugar and salt about 6-8 times until combined. Add the butter pieces and pulse again (about 16 times) until the mixture resembles coarse cornmeal and butter pieces are about the size of peas. Transfer the mixture to a large bowl then add ¼ cup of water at a time, stirring it in using a rubber spatula. Press the mixture against the sides of the bowl to form a dough until no small bits of flour remain (you may not need all of the water). Turn the dough out on a clean work surface and divide in two. Form each dough into a ball then flatten to a 6-inch disk. Wrap each disk in plastic wrap and refrigerate for at least 2 hours (up to 2 days) before using. To Prepare the Filling: Saute the beef and onions in all until the onions are translucent, about 5 minutes. Add the spices, hot sauce, salt and pepper and continue to cook for another 3-4 minutes. Set aside. This can be made a day or two ahead of time. To Assemble the Empanadas: Line 2 baking sheets with parchment paper and set aside. Roll out one of the refrigerated disks of dough on a lightly floured surface into an 18-inch circle about ⅛ of an inch thick. Cut out 4 to 6-inch disks (I used a bowl) and transfer them to the parchment-lined baking sheet. I got about 7 (6-inch) rounds from each disk--make sure you cut the rounds carefully since you won't be able to re-roll the scraps to make more rounds. Repeat with the remaining disks of dough. To fill the Empanadas, add around 1 heaping tbsp of the meat mixture, raisins, olives and egg pieces then fold one edge of the dough over to create a half moon. (Note: to make it easier, stir in the olives and raisins into the meat mixture.) Crimp the edges with the tines of a fork. 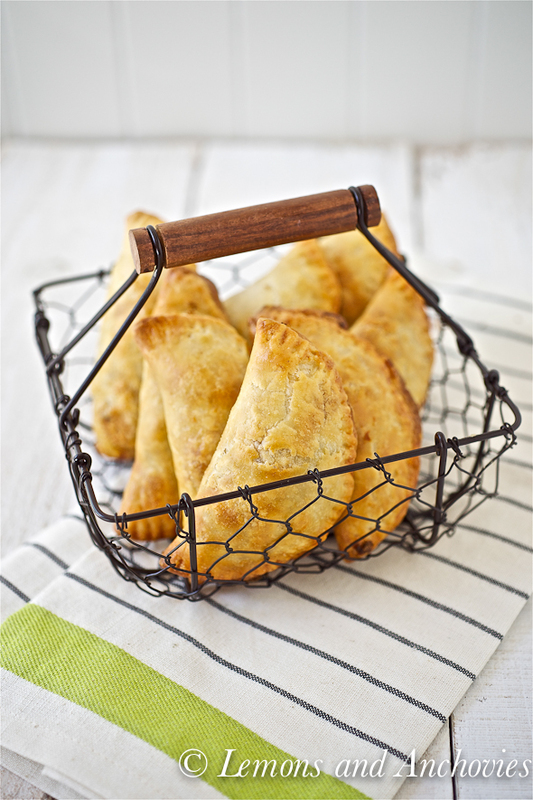 The empanadas can be refrigerated up to 3 days (or frozen up to 1 month) before baking. To Bake the Empanadas, preheat your oven to 425 degrees F. Brush the tops of the empanadas with the egg and bake until golden brown, about 20 minutes. If frozen, it may take about 25 minutes. (If using the convection feature of your oven like I did, I baked mine for 21 min at 400 degrees F.
Be advised even after reducing my source for the filling recipe by half, it was still much more than I needed for the one batch of the ATK dough recipe. You may reduce this filling recipe further by half or double the ATK dough recipe. Alternatively, you can use the leftover meat mixture in a frittata. ATK dough recipe posted here will make 14-16 empanadas. lovely travel photos as always! and these empanadas are equally delicious. Your styling is great. Jean, I enjoyed reading this post. It is beautifully described and images of you trip are just breathtaking. 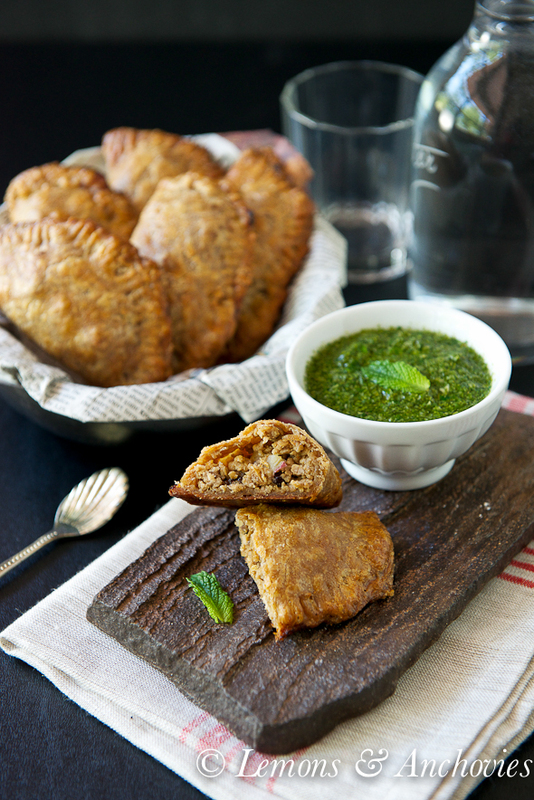 Empanadas de Pino sound very flavorful after I read this recipe, and pictures are really mouthwatering. The last pic look so tempting and delicious! I’m so glad you enjoyed this post, Sandra, thanks! Jean – Loving this post! I so want to go here – loved the entire series! I am so happy you posted the empanada recipe! Thank you for sharing these with me – they were DIVINE! Hope you are having a great week!!! Gorgeous photos, Jean! The colors of the water and sky are truly breathtaking and I know i’d love visiting the Mercato. 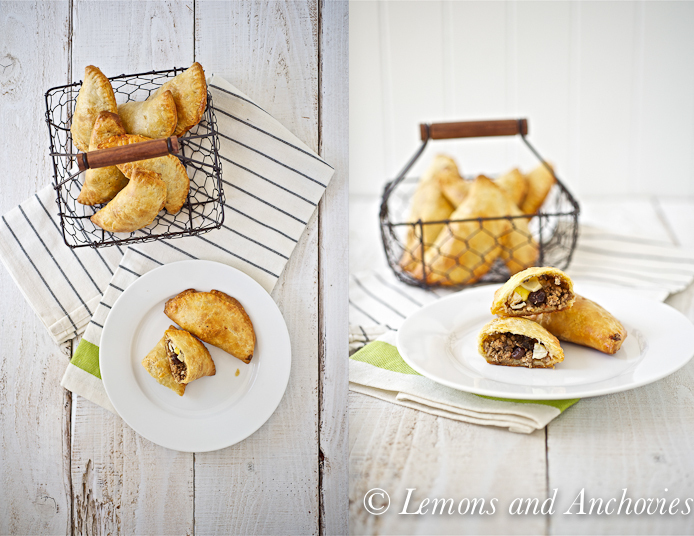 The empanadas look simply scrumptious! I bet these taste amazing! Those spices sound just perfect! You’ve given us a whole new perspective and expansive view of Chile! Stunning photos – I love the one with the raft approaching the falls at Salto Rio. I can imagine how wonderful that last Chilean empanada tasted by how perfect yours look! 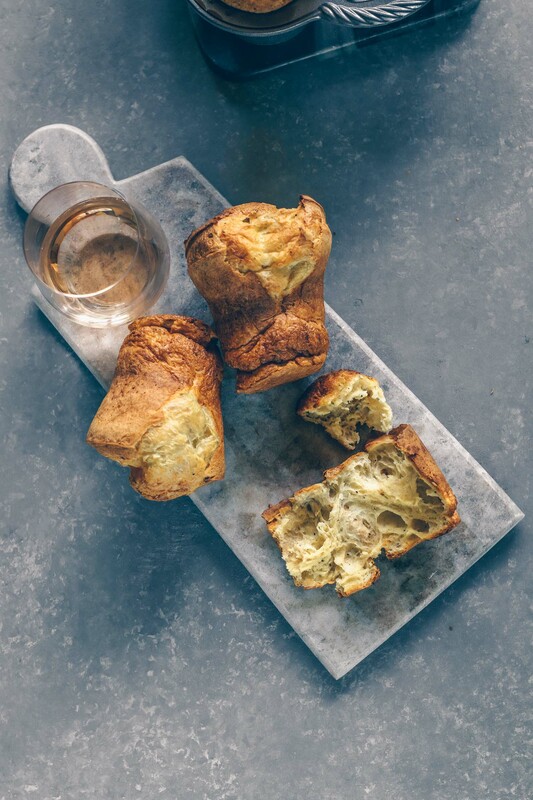 Beautiful photologue and delicious looking empanadas. I, too, have switched from fried empanadas to baked. Beautiful photos. I was in Peru last year but Chile has quite a different feel about it from the photos. Machu Picchu is the most spectacular place I have seen, even more so than Angkor Wat and that is saying something. Oh how I love empanadas too! I’d really like to try a Chilean variety though. I’ve only had and made the Peruvian kind. They seem to be fairly similar though! Your pictures from the trip look gorgeous! I’ve never been to Chile and it’s so nice to have a peek at how it is like in your travel photos. Thank you for sharing your adventures with us. I read the previous ones so this one is a beautiful conclusion to your series. Love the empanadas! What an amazing trip. The pictures are gorgeous! I would love to visit there sometime. The mountains are stunning, and the cities are beautiful! Great empanadas to remember the trip! Sigh, thank you for taking us along on your adventure! I have yet to visit Chile, so your photos will have to hold me over for a while. I must try the empanadas – I have a special place in my heart for the empanadas we both grew up on – but I love how these are baked and without the lard – definitely a must try for me! the photos and the views are absolutely breath-taking Jean. Thanks for allowing me to travel to Chile through your lens and writing, it’s always a pleasure to read you. Can’t wait to see what future spots you’ll talk us through. Beautiful photos of your travels,Chile looks like a nice place to visit. I had no idea Chile had such wonderful things to see. The empanadas look really good especially that crust so light and crispy looking. Fabulous post. Jean, fabulous post!! Your photos are so vivid, truly beautiful. Love the empanadas. Looking forward to your local spotlight posts!! Jean, first of all you are adorable in these photos!! Secondly how did you know that Chile is on my bucket list? It is great to learn about this region as I am thinking I want to do trekking in Patagonia and skiing in Portillo. I can make this part of the fun ~ though not sure how the weather would be in San Carlos de Bariloche in their winter. Doesn’t matter though, the scenery is breathtaking. I LOVE empanadas. This post should appear in Condé Nast Traveler. Well done! Too bad you didn’t have any of these left to share. I’m putting these on my too try list – sooner rather than later. I had no idea it was that gorgeous there, I could stare at that turchese water all day. Oh Jean! Your photos are absolutely fabulous!! I love travel posts and the images that go along with them, and I’m so excited to see this area of the world. I’ve never been there and it’s high on my list. Love the empenadas too! I have a friend from Panama whose mom makes them whenever she is in town, but I’ve not tried myself. You really nailed them, fantastic empanadas!